I and the team at The Xena Project want to thank you for a tremendous year. In 2014 we received 501(c)3 designation as a public charity, solidified our Veterans Group Days and Veterans Private Sessions programs, and launched the Family Reunification Program and Animal Encounter Therapy. We served 50 veterans during our first three months of operation, a tremendous testament to the needs of the veteran community and our unique ability to meet those needs with cutting-edge technology and innovative equine and animal programs. Click on the links in this paragraph to learn more, or click here to watch a news clip from KHOU Ch. 11 that aired on December 22nd. 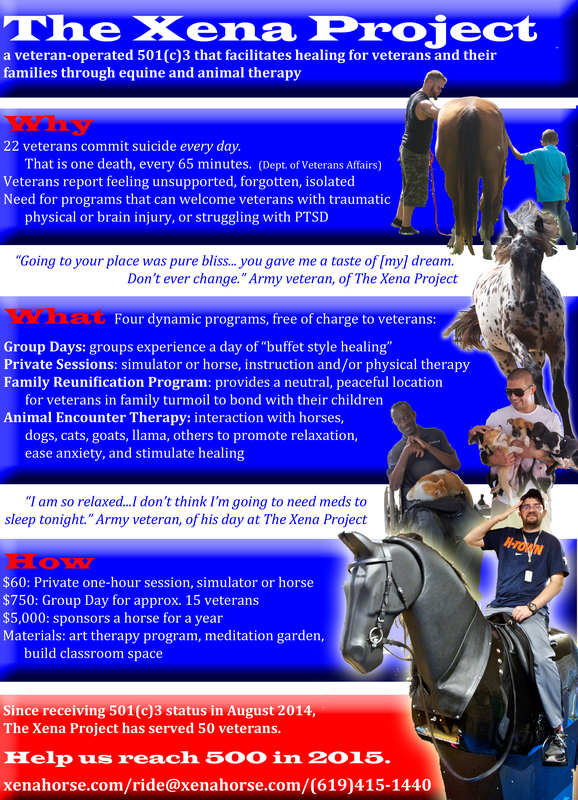 In 2015, we are committed to facilitating healing for at least 500 veterans and their families through equine and animal therapy. If you are considering a tax-deductible end-of-year donation, please help The Xena Project reach those 500 veterans. Whether to support the program of your choice or give general funds to help us build a classroom space, for very little you can change the way of life of those who already fought to preserve yours. If you prefer to donate in-kind, we are in need of an office computer and printer, Quick Books software, materials for the art therapy program, and outdoors benches and chairs for the meditation garden. Below is a file that provides a programmatic overview; you can learn more here at xenahorse.com. Please share these materials and this letter as widely as possible. Thank you for your continued support of The Xena Project. Happy holidays, from our herd to yours! ← Thank you, KHOU Ch. 11!